Go Big or Go Home! This is our 64oz growler option. 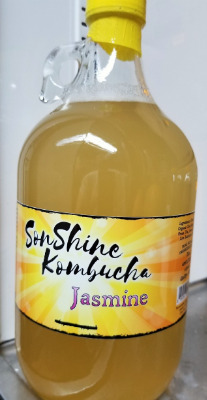 SonShine Kombucha Jasmine is made with premium quality Frontier® CO-OP brand Jasmine Green Tea. Fresh jasmine flowers infuse this delicate loose leaf green tea with their exotic scent. It is crisp, light and floral. Frontier® Jasmine flowers absorb the exotic fragrance when made into tea, making it a sensual pleasure to drink. We hope you enjoy our Jasmine Kombucha! Please see "64oz Growler Exchange" if you have a growler to return. Market Wagon will exchange your empty growler for a new one.